Education:　Dr. Sonoo graduated from The Veterinary Department of Veterinary Medicine of Nihon University, and acquired a veterinarian license. 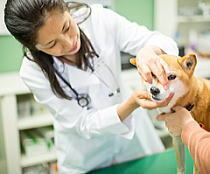 Career:　After working at veterinary hospitals in Tokyo, Kanagawa and Saitama for several years, Dr. Sonoo set up her own clinic in Karuizawa in 2009. I opened my animal hospital in the nature-rich town of Karuizawa, with an aim to pursue a harmonious relationship between nature, animals and people. As I want to be able to give animals the best possible treatment, I participate in as many academic conferences and seminars as possible so that I can draw on the latest information and knowledge in my daily practice. I also support and participate in environmental activities to help preserve our precious nature. I heartily wish that animals and people will be able to live happily together in a place full of beautiful nature.